Spring is one of my favorite seasons, rivaled only by Autumn. I mean, I guess it's got pretty good odds of being your favorite season too...since there are only 4 seasons to choose from! Summer in South Georgia is just too hot to make my #1 spot. I'm not fond of the cold, and although it doesn't stay cold for long here, it does become a lovely shade of brown outside...not my thing. Spring, on the other hand, brings the most wonderful weather here and everything turns green. One of my favorite color combinations is green and white. So, for Spring, that's the palette that I chose most often in my home. 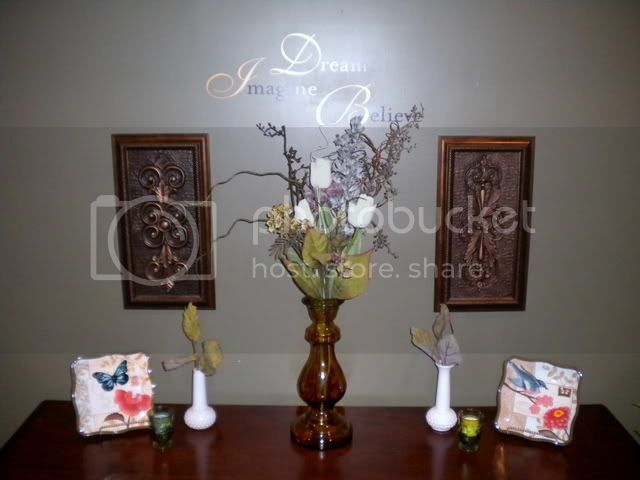 I have more pics to post later, but for now, enjoy a trip around the living room and foyer at some of the Spring Decor. 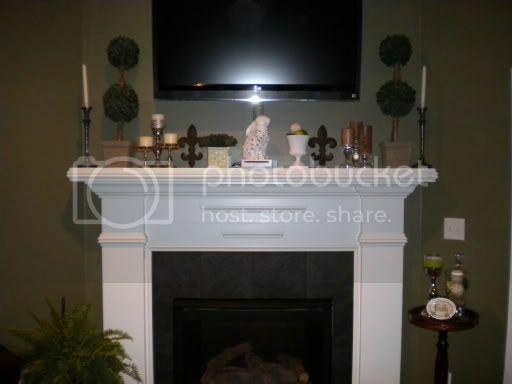 These topiaries and the candlesticks on the ends live on my mantle almost all of the time. I've moved them a few times, but they always find their way home. The topiaries came from Kirkland's a few years ago. I honestly don't recall where the candlesticks came from. The shortest silver candlestick came from shopgoodwill.com. The second highest is just a regular thrift store find with the silver candy dish on top. I bought the dish in a set with the other "matching" candlestick. I don't remember how much the set was, but I can promise you that it was under $20. The fleur de lis are actually very heavy and designed to hang outdoors. They were $5/pair at a yard sale! The little tin box with the greenery was $1.91 at Goodwill last year. I remember this because the price is still on the bottom! 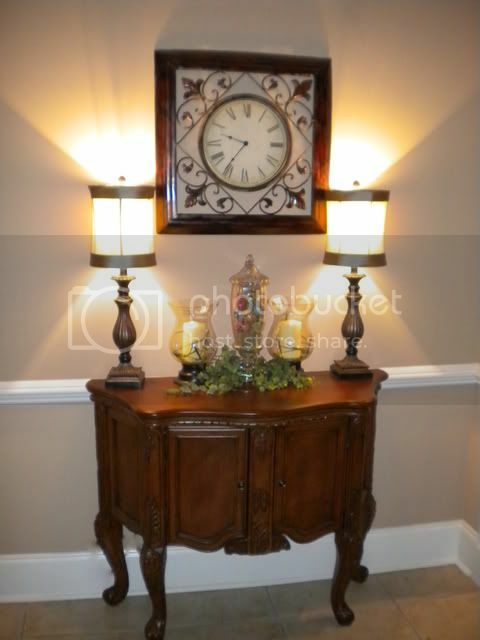 The white urn was another shopgoodwill purchase and again was under $10 including shipping. I think I bought it with a few bud vases. Unfortunately, I don't shop there much anymore because it seems like the shipping prices are always very high! 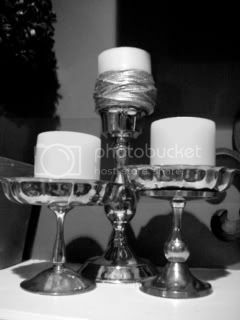 The glass candlesticks were a gift from my Mom...so you can bet they were on clearance! Like Mother, like Daughter! 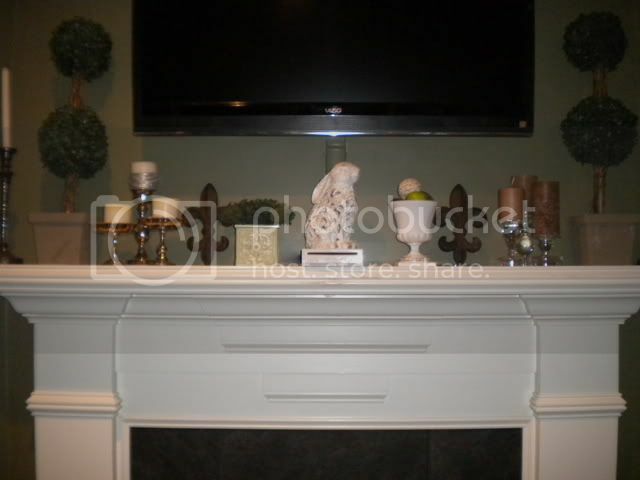 To the left of our mantle is a console that is currently home to some 50 cent hobnail bud vases that I LOVE. These came from a juntiques store in Sasser, GA. The pretty plates came from Hobby Lobby (50% off of course!). The wall art is from Kirkland's about 4 years ago. The large vase is from Pier One and was a steal a few years ago for $16. 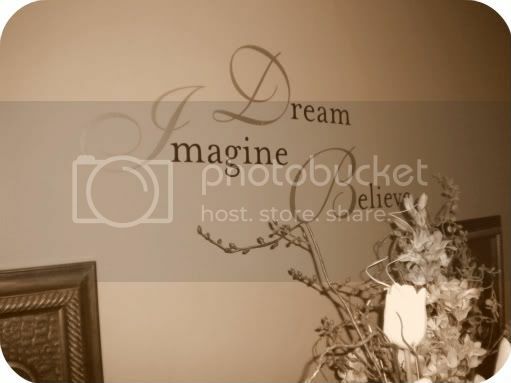 The "Dream, Imagine, Believe" quote was a gift from a dear friend and looks perfect there. One more photo from the living room is from the table to the right of the fireplace. 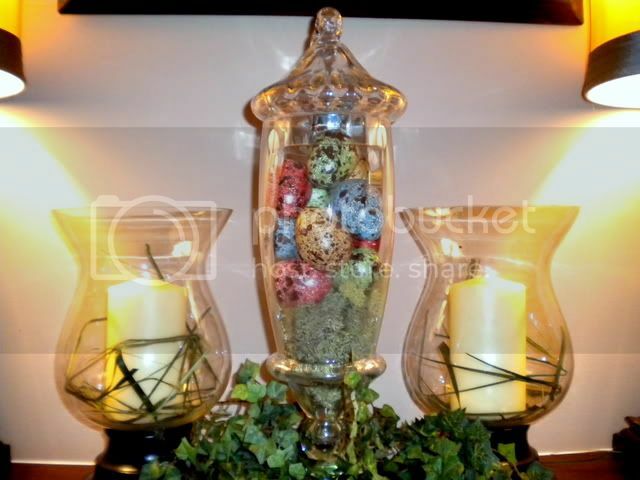 And in the foyer, we have a Hobby Lobby vase with beautiful eggs flanked by two Dollar General *yes, you read that correctly* hurricanes. On each side are my Hobby Lobby lamps. The clock is one of my free gifts from a Home& Garden Party that I had last year. The side table has been with me for quite a few years. I'm a little embarrassed to say that it came from a catalog called Seventh Avenue and was a terrible purchase...I paid way over it's value. Oh, well! It works for now! 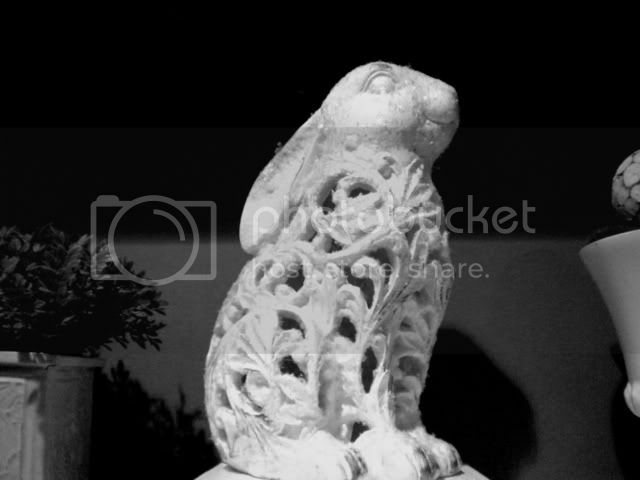 I'm linking to Nifty Thrifty Tuesday's. Do you have a link party you think I should join? I'd love to, so please invite me! Thanks! Looks like you have a good eye for spotting the deals! 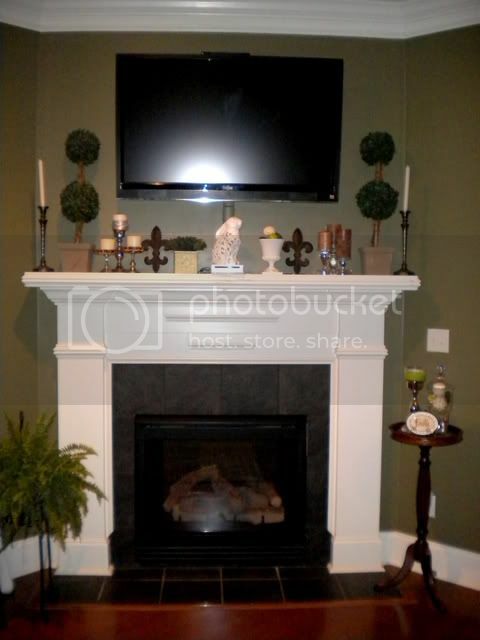 I love your fireplace and Spring touches! Spring and Fall are my favorite seasons, as well. I appreciate your advice on glue and veneer removal. I will remember that for the future. Very clever! 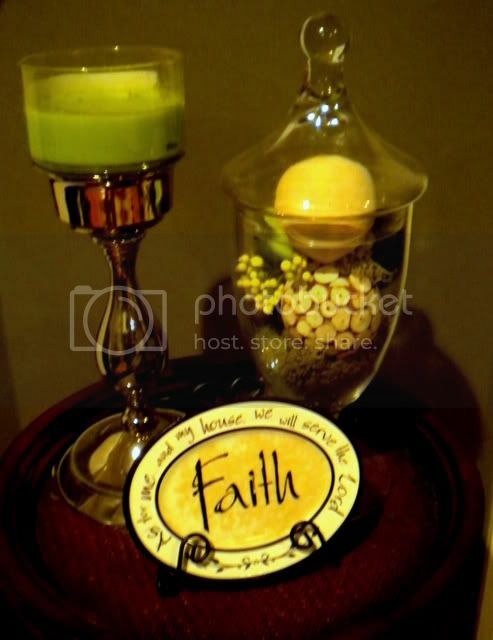 Soooo many awesome deals...my favorites are those silver candy dishes...thanks for comng to my party. Thanks for leaving a comment on my blog! I am addicted to shopgoodwill! I usually just shop my local store on there so I can go pick it up and not pay shipping but I check it almost everyday! The shipping is a little outrageous. You have a cute blog! I love it and I especially love all the deals! !